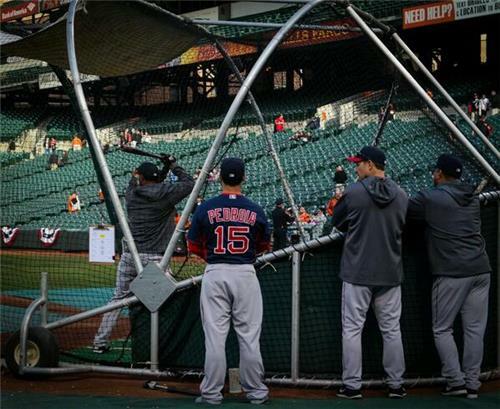 Steve Silva has your live updates from Camden Yards in Baltimore as the Red Sox face the Orioles in Game 2 of the season. As former Red Sox manager Joe Morgan was fond of saying: 6, 2 and even. The Red Sox evened their 2014 record at 1-1 after a 6-2 victory over the Orioles at Camden Yards Wednesday night behind the strong starting pitching of John Lackey and the big bat of first baseman Mike NAPoli -- not NaPOLi, Mr. President. Napoli's two-run single extended the Red Sox lead to 6-2 in the top of the seventh inning, and that lead would hold up. Right fielder Daniel Nava led off the inning with a single, then Dustin Pedroia followed with a soft ground ball to Orioles third baseman Ryan Flaherty who committed an error on the throw to first base allowing the runners to advance to second and third. Reliever Ryan Webb then intentionally walked David Ortiz, and Napoli made the Orioles pay as the Sox first baseman belted a line drive two-RBI base hit scoring Nava and Pedroia and giving him four RBIs on the night. In the fifth inning, Napoli homered on an 0-2 pitch from Orioles starter Ubaldo Jiminez to give the Red Sox a 4-2 lead. Nava, who was hit by a pitch to lead off the inning, came in on the two-run shot by the burly Red Sox first baseman. Last season, Napoli tied for the MLB lead with six games with at least 4 RBIs. Lackey was cruising along into the fourth inning before Game 1 Orioles star Nelson Cruz crushed his second home run of the season with Chris Davis aboard to tie the game at 2-2. In the top of the third, Ortiz crushed a Jiminez pitch way over the wall in right field for his first home run of the season with Pedroia aboard to give the Red Sox a 2-0 lead that wouldn't hold up for long. The deep blast was Ortiz's 432d career home run, passing Orioles legend Cal Ripken Jr. (431) for sole possession of 45th place on the all-time MLB career home run list. The inning prior, Pedroia made a spectacular defensive play when he dove into the hole directly behind second base and threw out Orioles shortstop J.J. Hardy to end the second inning. After giving up a leadoff single to Nick Markakis, Lackey retired the next 11 batters, getting four O's to strike out, before the Orioles rallied to get on the board. Lackey's night ended after six innings of solid work. He threw 90 pitches, 68 for strikes, giving up just three hits and two runs on the Cruz homer, walking one and striking out six Orioles. Red Sox reliever Edward Mujica made his debut with Boston tonight, he worked the seventh inning, giving up a single and recording a strike out before being replaced by Junichi Tazawa, who pitched a scoreless eighth. Closer extraordinaire Koji Uehara came on to finish off the Orioles in the ninth in a non-save situation. Uehara would load the bases, but closed things out and the Red Sox came away with the win. Ortiz tonight became the 7th player to homer for the Red Sox in 12 consecutive seasons. He joins Yaz, Evans, Ted, Rice, Tek, Rico. Mike Napoli has the first 4-RBI game of the season by a Red Sox. Last year he tied for the MLB lead with 6 games with at least 4 RBI. (Sometimes they just write themselves) BALTIMORE -- Mike Napoli made a name for himself Wednesday night. And there is the value of Ortiz in action. Teams fear him and the Sox are deep enough to make them pay. Mercy, what a game for Mike Napoli - 4 RBI. Orioles intentionally walking Ortiz to load the bases with one out for Napoli. This may not end well. 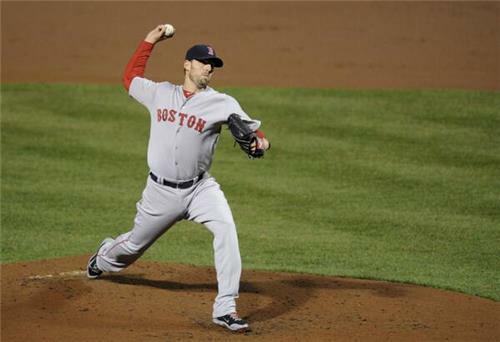 With 3 innings to go, the #RedSox maintain a 4-2 lead after John Lackey retires the Orioles 1-2-3 in the 6th inning. John Lackey with 4 strikeouts after whiffing Nick Markakis to end the 3rd inning. The #RedSox maintain a 2-0 lead. This game is flying.. 7:57 and we're into the 4th inning. After giving up a lead off single, Lack has retired 9 straight - 4Ks. Nine straight batters retired by Lackey after the leadoff single by Markakis. When all else fails, let Pedroia get on base and let Ortiz swing for the fences. @RedSox have their first lead of season. Ortiz has hit 19 HR at Camden Yards, moving into 3rd place as a visitor here. His 39 HR vs. Baltimore are 2nd among actives to A-Rod (61). Ortiz had two hits in spring training. He’s 2 for 6 in the season. The #RedSox lineup has hammered Jimenez. But Ortiz was 0 for 8 before the HR. "That home run was a Samsung special moment and went out of here like it was on Jet Blue,” Ortiz said. "When the lights pop, Papi pops." - @davidortiz 2/27/14. First night game: David goes yard. 2-0 @RedSox . Gone! @davidortiz , with @15Lasershow on base, belts his first home run of 2014 to give the #RedSox an early 2-0 lead in the 3rd inning. That was David Ortiz's 432nd career home run, passing Cal Ripken Jr. (431) for sole possession of 45th place on the all-time MLB list. Ortiz with a wallop out to RF. He now has 432 HRs, one more than Cal Ripken Jr. Ridiculous play by Pedroia to end second inning. Fan screaming for replay. They’re not getting it. First star in the scorebook this season. Umpire Ron Kulpa loving the outside corner tonight for both pitchers. Three strikeouts by Red Sox batters tonight... all looking. No score entering bottom of 2. No score through 1 inning at Camden Yards as the #RedSox and Orioles enter the 2nd inning. Grady Sizemore set to lead off. Tuesday was the 2nd time @JackieBradleyJr met the President. Visited White House after South Carolina won NCAA title his sophomore year. 10 innings, 14 LOB, 0-12 with RISP for the #RedSox so far. You wanted Jonny Gomes... you got Jonny Gomes tonight.... but he gets caught looking to end the first inning rally for the Sox. Plenty of open seats here at Camden Yards for Game 2 on a pretty nice night. Orioles Fever still needs to be caught. ICYMI: Nava RF, Pedroia 2B, Ortiz DH, Napoli 1B, Gomes LF, Sizemore CF, Bogaerts SS, Pierzynski C, Middlebrooks 3B, Lackey SP. Jimenez on the mound, and we're underway in #Birdland ! Play ball! 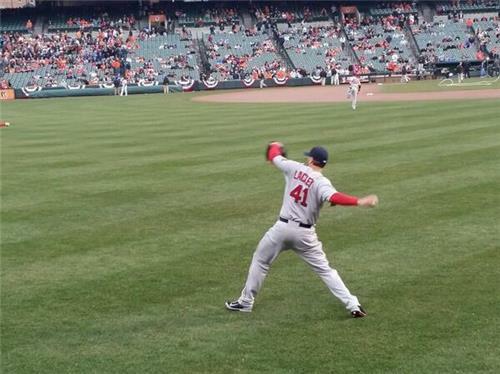 @dnavs33 leads off the game for the #RedSox , as they take on the Orioles in the second game of the series. Nice move by the Orioles with a moment of silence pre-game for Boston fire fighters Walsh and Kennedy. In honor of the 2014 season, @TastyBurgerUSA is giving out 2,014 free burgers tomorrow! First come, first served 11-3. Fenway location only.